Green Business Norway has appointed one person in charge with the project assistance. 2.1. Purchase of new 25 Packaging waste recovery unit – procurement process has been finalized. The units are under delivery and installation by batches, until second quarter of 2015. 2.2. 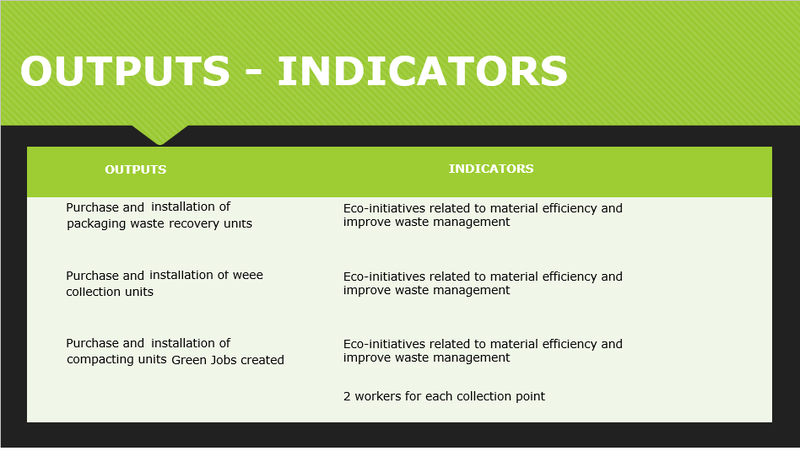 Purchase of new 25 Weee collection units - – procurement process has been finalized. The units are under delivery and installation by batches, until second quarter of 2015. 2.3. Purchase of new 25 Compacting units - – procurement process has been finalized. The units are under delivery and installation by batches, until second quarter of 2015. The following activities have been performed up to date: waste collection system, built as an integrated multi-waste collection point which allow for the voluntary collection from population of solid non-hazardous recyclable waste, such as: PET bottles, aluminum cans, glass, PE film, tetra pack, cardboard/paper, polystyrene, electric and electronic waste, lamps, batteries, by incentivizing them through a voucher system to bring the waste to the collection point.